I'd been hired to for a commercial shoot featuring a good friend of mine who'd been working along side us in Cambodia. 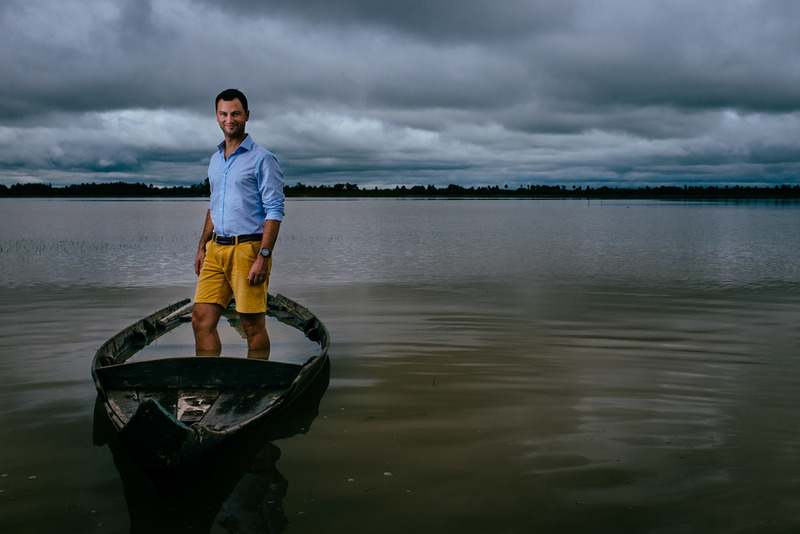 The plan was to shoot a series of portraits and a photo essay of Scott who worked as an accountant focusing on NGO best practice and auditing work in South East Asia. On a recent trip back to Australia I picked up a compact lighting kit, specifically for the shoot with Scott. The kit comprises of a LumpoPro LP180 Flash, Westcott folding umbrella, two pocket wizards and a backlight stand to hold it all together. The total price of the lighting gear is around $500. This small lighting setup, combined with the Fuji x100s and it's leaf shutter make it possible to sync the flash at a high shutter speed. Essentially this means I can make a portrait in very bright conditions, using a fast shutter speed and a wide open aperture to maintain a nice shallow depth of field. Something I would only have been able to achieve with a much bigger (and more expensive) lighting kit and a set of ND filters. My current compact lighting kit. As often happens in Cambodia we drew a small crowd of onlookers. I took the opportunity to make an image of a young boy who'd been watching us work. In the images below you'll be able to see my lighting set up in action with Shelley my great friend and lighting assistant holding the flash and umbrella for me. Early one morning I decided to set out on my bicycle to cycle through Chreave Village. 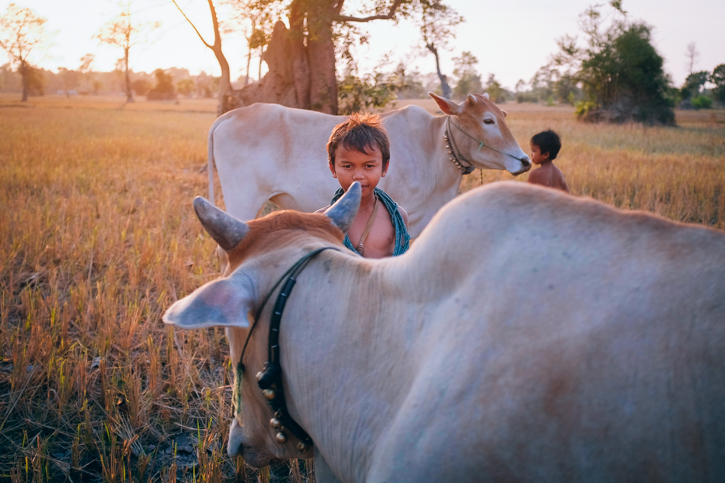 Chreave village is one of my favourite villages in Siem Reap to visit and photograph. I approached the local Pagoda as the sun was just starting to burn away the early morning haze. The light was beautiful as it bounced off the main temple and surrounding stupas. As I parked my bike and took my hat off, I was met by one of the head head monks. He greeted me with a smile and took my hand, offering me a seat outside his home and a cool coconut to drink. I referred to him as Da Khun (head monk). After speaking for a while, I indicated that I was a photographer. He told me that he was a teacher and asked if I would take his photograph. I had the honor of being able to photograph him holding a prized portrait of the Monk who had once been his teacher. We visited the school he was taught in as a boy, which has now fallen into disrepair. From that morning on we formed a friendship. I would visit him often over my time in Cambodia. 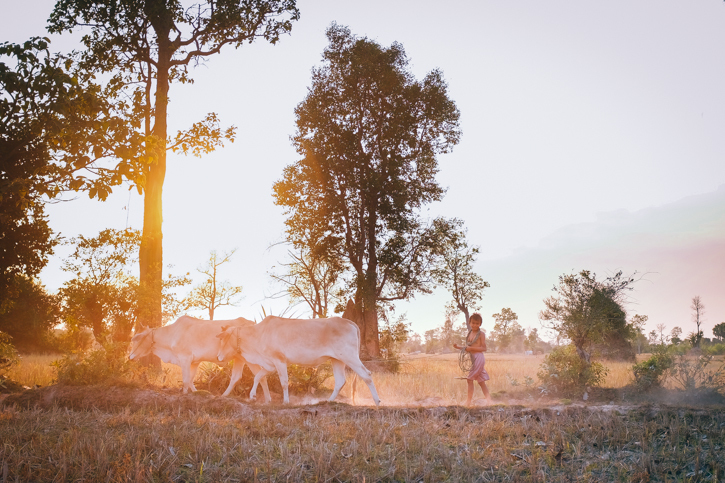 My wife Izzy and I work in a rural village running the NGO Harvest Cambodia. Our organisation trains village school teachers and provide schools with curriculum support, teacher sponsorship and school resources. 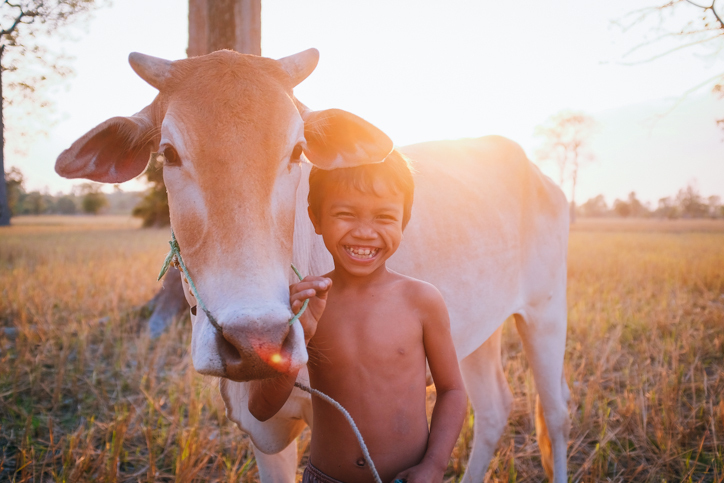 The children in our village all come from farming backgrounds. After they finish classes for the day, they are expected to help with work in the fields. One afternoon it was a particularly beautiful sunset so I took a walk through the dry rice fields to watch the sun set. 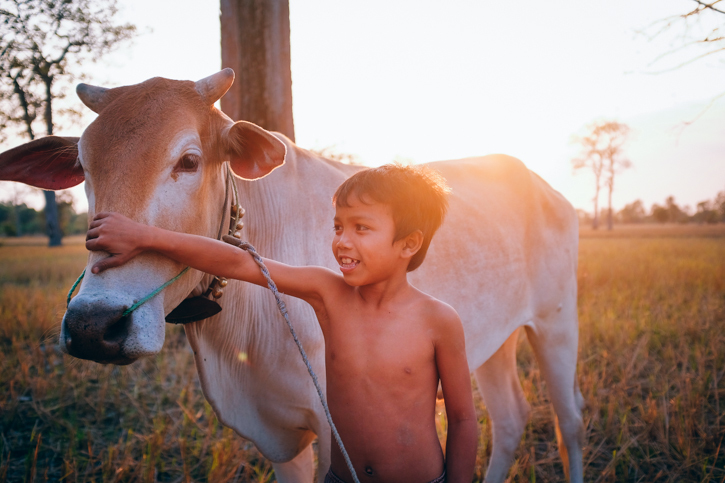 While soaking in the beautiful sunset, I heard "Hello Mr. Doug" being shouted out as two young brothers came past, leading their family's cows in for the night. They pulled them to a halt and called me over to say hello before rushing off again to beat the approaching night fall.